Trim the shaft of your True Temper golf clubs to ensure the correct fit. True Temper golf shafts can be trimmed to custom-fit the club to a player's height. This can also be helpful when purchasing secondhand golf clubs that are the wrong size, or passing your old clubs onto a child. 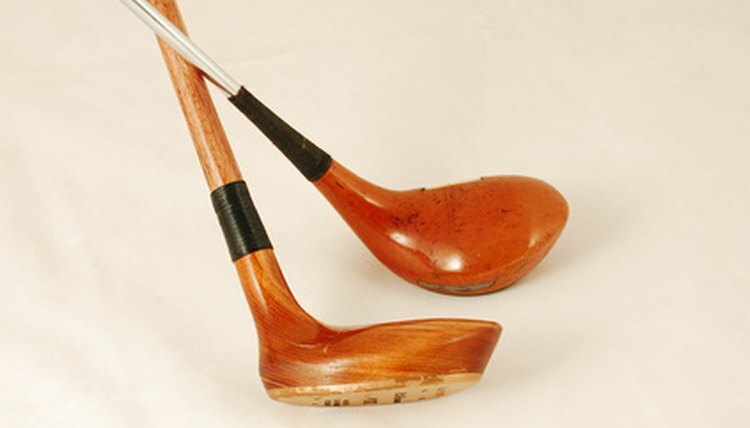 Golf shafts are tapered at the head end so they can flex on the swing. Because of this, you must trim the shaft from the grip end so that the narrow end will still fit into the opening on the club head's hosel. Use a shaft clamp to hold the golf club in place while you work. Cut down one side of the old grip with a utility knife. Roll back the edges to peel the grip away from the tape on the club shaft. If the tape is still sticky, use a solvent to break down the adhesive as you pull up on the grip. Use your utility knife to scrape off the layer of tape. Use solvent and a soft cloth to wipe down the end of the shaft until all of the tape residue is gone. Dry the shaft with a another cloth, making sure that no lint is left behind. Measure out the desired length of the new club and wrap a layer of masking tape around the shaft at that point. Use a ballpoint pen to make a line on the tape at the exact point where it will be cut. Follow the instructions in your rotary tool's owner's manual to insert the blade attachment. Turn on the tool and cut the club shaft according to the line you marked on the masking tape. The tape should keep the edges of the shaft from splintering or cracking as the blade slices through it. Always wear safety goggles and keep hair, loose clothing and jewelry away from the rotary tool when it is in use. Sand down the end of the shaft with fine grain sandpaper. Measure the length of your replacement grip. Use this measurement to determine how far down the shaft to apply the grip tape. Wrap the tape around the shaft while overlapping the previous layer of tape so there are no gaps or wrinkles. Block the hole in the end of the new grip with a golf tee. Apply grip solvent to the inside of the grip and cover the open end with your thumb. Shake the grip several times to spread the solvent over the entire surface. Slide the grip over the end of the shaft and push it down until there is no space between the club and the base of the grip. Let the club dry completely before trying the new grip. Squeezing or twisting the grip before the solvent has evaporated may cause it to bunch up or wrinkle.